Kris “Tanto” Paronto, a hero of the Benghazi attacks in 2012, is scheduled to speak in Texas on Oct. 2nd. His speech is already sold out. But there are rumors floating around that a protest is being organized against his speech. 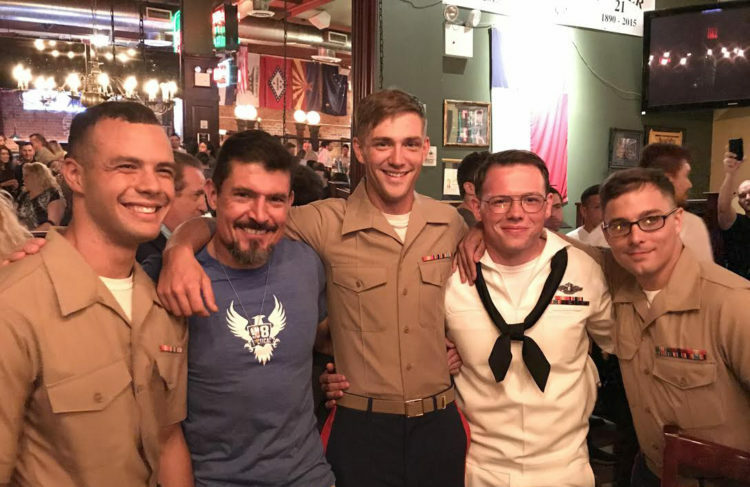 One notable report suggests that he could be protested because Paronto might “talk politics and offend members of the Victoria Islamic Center” in Texas. Boo, freaking hoo. “A planned protest has formed to get tickets for the program, but then not show up, to decrease attendance to the lecture,” the Victoria Advocate reported. Wonder if they bought any of the tickets up for the lecture. Hope not. Paronto is one of the heroes of Benghazi. He survived the 2012 terror attacks on the US compound in Benghazi, Libya in 2012. He was part of a CIA security team there. He fought with two other guys for more than 13 hours, fending off Islamic terrorists and he helped save more than 20 lives. The book, “13 Hours” tells of the battle. Paronto also wrote the book, “The Ranger Way.” He is a former U.S. Army Ranger from the 2nd Battalion, 75th Ranger Regiment. Right now, he speaks a lot at public and private speaking events. And he does a lot of book signings these days to promote his work. Paronto has repeatedly said that he served with all kinds of warriors, including Muslims, and they “know that I see the person alongside me as a person. I don’t care about their gender, race, religious beliefs or ethnicity. What I see is the person’s actions and their integrity,” he pointed out. “If these possible ‘protesters’ did their due diligence, they would know that. But the majority just continues to believe the things they see on CNN or read in The New York Times, taking it at face value. My advice: get out of your safe space, protesters. Put your false pride aside and challenge your paradigms,” Paronto added. The first amendment gives us the freedom to speak and also to protest. As soldiers, we fight to protect your rights…. Magically, the original article that wrote about this on the Victoria Advocate’s website has disappeared. Convenient. It baffles me why any American, Muslim or otherwise, would protest a hero like this that saved American lives. He doesn’t bash Islam. He states the facts and talks about radical Islamists. So, unless the protesters are all aspiring terrorists, they should not have a problem with his speech. The truth of the matter though is that radical Islamists and communists are the ones objecting to the speech. They hate America and they hate heroes like Paronto who have courage and strength. 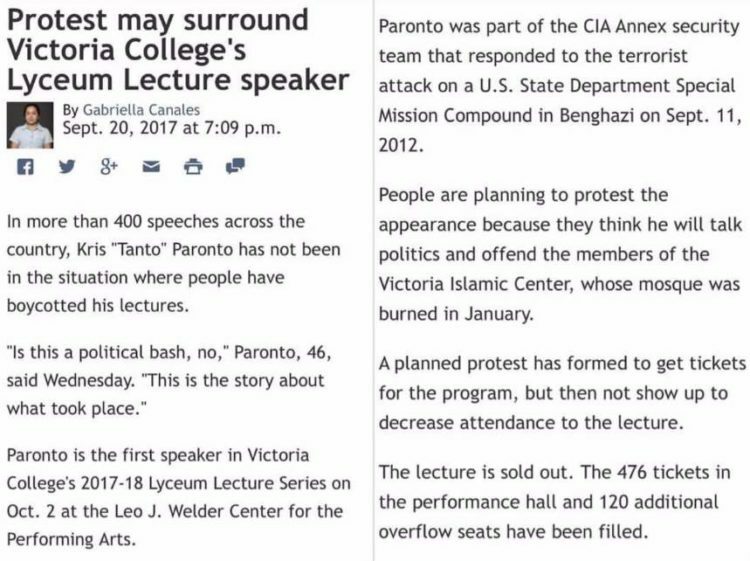 Anyone wanting to protest Paronto should instead attend his speech and engage him in thoughtful dialogue and debate. They just might learn something.